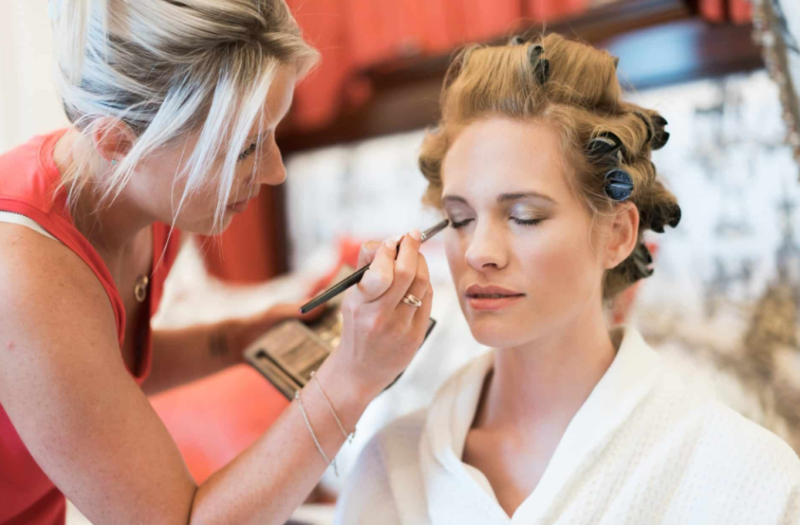 To avoid falling at the first hurdle of recuiting a hair and make up artist for your big day, it makes sense that there are a few key indicators as to whether they will be good or not - but other than surfing reviews and looking at previous work, what else is there to go by? Expert hair and make up artist Camilla J Collins is our insider today and will be sharing with us all the tips and tricks on how to spot whether the stylists you're looking at are the right ones for you. "I truly believe the key to a great wedding hairstylist and wedding makeup artist is their ability to listen and interpret their client’s ideas. You wedding hair stylist and makeup artist should be able to take on board your concerns and easily find a way around them so don’t be afraid to speak up - in fact it is very important that you do! You may think you are being difficult but you really aren’t, I promise! I love it when my clients have lots of questions for me and I love it even more when I can overcome their fears or suggest alternatives that they love! If you have concerns about your hair type or length then there is no harm in picking up the phone or firing off an email to your stylist who will be able to help you more than anyone else. They are the one who will be styling your hair and they know what can be achieved. If you’re not satisfied with their suggestions then by all means shop around and get a second or third opinion. The same goes for any skin concerns you may have. While your makeup artist is not a dermatologist and may not be a complete expert with skincare, you'll want to know that they are used to dealing with different skin types, in particular, ones just like yours! Talking is great and you will definitely be able to get a feel for your artist’s experience just by speaking with them over the phone. If you’re still not completely convinced then have a look through their website and social media pages to see if they have a variety of brides, mothers of the bride and bridesmaids that they have worked on. This same idea goes for hair too. A common question I get asked a lot is “what products do you use?” This is a good initial question to ask as their response will be a great indication of their experience. I’m a firm believer that there isn’t one company out there where every single product they produce is better than all the others, and a makeup artist with an extensive range of brands means their kit has been built up over a lot of time and they have really played around with testing products out. It also means that they are not affiliated to one brand so you will be getting what is truly best for you. So, should you use your regular hairdresser for your big day? Well that really depends on your hairdresser. A lot of salon stylists don’t normally do a lot of hair up and as much as they are great at cutting and colouring your hair, they may not feel as confident dry styling your hair for your big day. Again, there is no harm in asking. Next time you are with them, casually ask about their thoughts on hair up and if they enjoy doing it. They may even have some pictures they can show you or if not, they may have some recommendations they could give. You can certainly have a play around with makeup on the makeup counters in department stores. Be careful though as it could end up costly if you have to redeem their time on a lot of products. On the flip side, you could love what your makeup artist does for you and see if they are available for your wedding day. Even if you don’t love what they do, you’ll certainly find out what you don’t like! It’s all in the name of research! Communication is key so do your research, speak to a few hair stylists and makeup artists and get a feel for them and how they work and above all, don’t be afraid to ask questions! If you would like the lovely Camilla and her team to do your wedding day hair and make up, you can enquire here.